New Candys have shared the mesmerising visuals for ‘Tempera’ from their third LP ‘Bleeding Magenta‘, out now on Fuzz Club Records. New Candys hail from Venice, Italy and formed back in 2008. After recently reissuing their highly-praised first two LPs ‘As Medicine’ and ‘Stars Reach The Abyss’, the four-piece are teaming up with Fuzz Club for the release of their third album, ‘Bleeding Magentas’. Their latest effort is a seriously impressive collection of dark, swirling psych-rock – atmospheric yet overdriven, pacing but ethereal, brooding at times but always wallowing in a dazed pop sensibility, ‘Bleeding Magenta’ see’s New Candys’ songwriting at its best. “Tempera” from the album “Bleeding Magenta” out 6th October 2017 on Fuzz Club Records. The album title can be read as a cinematographic reference, where there’s fiction there’s no real pain. During the writing process we kept in mind the release format of a 12” vinyl and treated it as an extra influential element. The first side at 33 rpm with most of the songs written meticulously, the second side (tracks 8-11) we acted the opposite way, no limits, one long medley without overthinking, at 45 rpm. Visually inspired by Refn’s last movies and Argento’s early movies. Written, performed and produced by New Candys. Fernando Nuti: vocals, guitars, sitar. Guest vocals on “Sermon” by Julia Hummer (juleah.com). “Bleeding Magenta” is the third album of New Candys, coming out on October 6th for the Fuzz Club Records. The Venetian band, one of the most international realities that exist in Italy (judging also from the coming dates, between Italy, Germany, Poland, Denmark, England, Austria …). Double a-side 10″ split single with Kill Your Boyfriend released 19th January 2015 on Shyrec / Xnot You Xme. 50 copies. 14 songs. The sold out record “Stars Reach The Abyss” is available in audio cassette for the first time, previously released on cd and vinyl (both sold out). Every cassette has been carefully hand-numbered by the band. The tracklist has been revisited with the addition of two songs previously available only digitally and on the vinyl edition of the album: “Salar” and “Dry Air Everywhere [Breath Into You Mix]”, a mind-blowing remix by John Wills (Loop, Pumajaw). Digital download card included. Written and performed by New Candys. New Candys performing Overall. Here’s the video for “Overall” directed by Jordy Tempelman, young cinematographer from Amsterdam, we gave him complete freedom and this is his take on it! 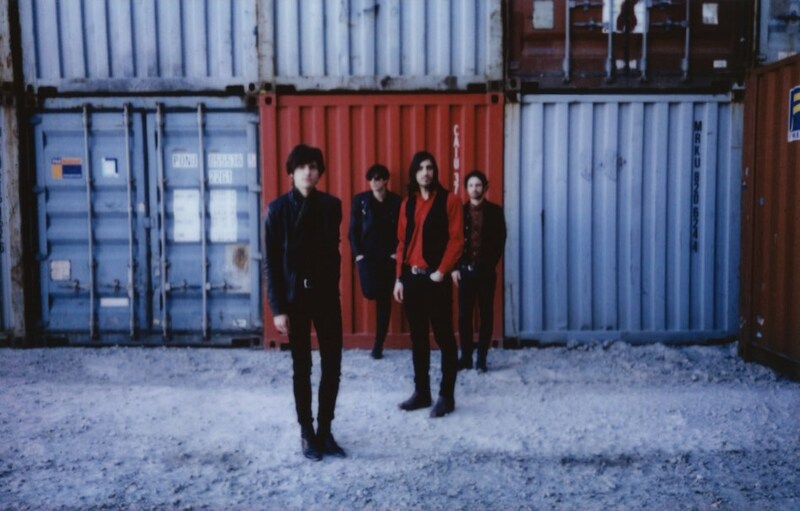 From the album New Candys As Medicine out on Picture In My Ear / Fuzz Club Records. a psychedelic power trip that demands your attention from its opening bars. …surrounded in a fair degree of fuzz and an oh so inviting darkness. Indie combo with a vintage British flavour and a knack for atmospheric psych-y confections. “New Candys’ chemical recipe verge more on a psychedelic drift, like their beautiful LP ‘Stars Reach The Abyss’ showed a couple of years ago. Hypnotic and sedated with ‘Dark Love’, faster and acid pop garage with ‘Surf 2’. The quartet know how to write a song and keep the good vibe on, wisely dosing vintage and ideas.” . “Dysfunctional trip, ‘Meltdown Corp’ by New Candys from Venezia, conjures gorgeously dislocated, psych-soaked abyssal plains.” The band are Stefano Bidoggia: bass, organ. Dario Lucchesi: drums, percussion. Diego Menegaldo: guitars, vocals. Fernando Nuti: guitars, sitar, vocals. “Their song ‘Meltdown Corp’ it’s an absolutely jaw dropping track. In fact, I had not heard of them until this, and I was on…line ordering their album before the song was even over. And then I played the song again. And again.” .